New t-shirts for a limited time! Want to help us help animals? Great! 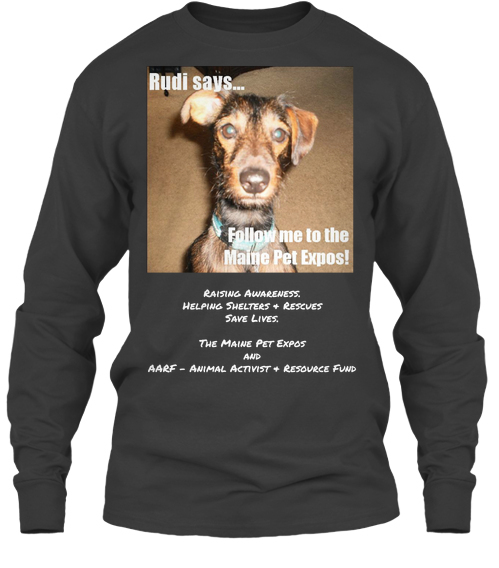 Now you can buy a “Rudi Says…” long sleeved t-shirt through crowd-sourcing site Teespring. Buying one (or more) will help us support rescues! Available for a limited time,only through August 11! This entry was posted in Androscoggin Pet Expo, Bangor Pet Expo, General, Southern Maine Pet Expo. Thank you for your interest in being the designated non-profit for our upcoming show! Please complete our Request for Proposal Form to help us in our decision-making. Applications are due on June 15, 2013 with a decision made by June 30, 2013.This allows us more than four months of marketing & public relations regarding the winning organization – and we expect that you will use this time to market your role in the event, and the event itself. We will encourage donations from all attendees at the door of the show (advertised in advance). You tell us what you need. A 3 minute introduction of your organization from the podium each show day. Your completed one-page proposal must reach What a Great Event! no later than 06/21/2013. You can fax it to us at 207 / 784.3950, email it to LSnyder@regroupbiz.com or send it via snail mail. We don’t want you to miss the deadline, so hurry and get your proposal in to us! Good luck! If you love animals the way we love animals, we hope you’ll get involved with The Maine Pet Expos. This year (2013), we will produce two pet shows, the Greater Androscoggin Pet Expo on September 21-22 (note new dates!) at the Lewiston Armory on Central Avenue and the Greater Bangor Pet Expo on October 19-20 at the new Cross Insurance Conference Center in the old Bass Park Complex. FMI: Please join our discussion group on Facebook at https://www.facebook.com/groups/MainePetExpos, and “like” our page: https://www.facebook.com/themainepetexpos. We’re also working on a non-profit to raise funds for animal rescues – AARF – Animal Activist and Resource Fund. You can read more about AARF at https://www.facebook.com/AARF.AnimalActivistResourceFund. We foster dogs through two rescue organizations (Maine Lab Rescue and The Pixel Fund), and collect donations for several rescues. For more information on either of these efforts, please contact Linda at LSnyder (at) regroupbiz (dot) com. This entry was posted in Bangor Pet Expo, Designated Non-Profit. The Greater Bangor Pet Expo, Oct 19-20, 2013. We are serious animal people – both my husband & I have nearly always lived with a menagerie of companion and farm animals ranging from our beloved dogs & cats, to pet mice, white rats, rabbits, chickens, cows, horses, pigs… you name it! Presently, in addition to our own three dogs (two of them rescues, the other a “free pup” found at a neighborhood store) we foster dogs coming out of high kill southern shelters – and have helped save the lives of more than a dozen wonderful dogs thatotherwise might have had no chance. Our role in those rescues is minor; we are in complete awe of the organizations that put their hearts and souls – and time, energy and money – into saving every creature they can. We hope our Pet Expos will help raise awareness and desperately needed funds for those rescues, while also offering an avenue for pet-related businesses, organizations and responsible breeders to find new customers and friends. veterinarians, veterinary supplies, and more! This show and others are produced by What a Great Event! (my events planning & management firm) dba The Maine Pet Expos – you can find both business names on Facebook. We also hope you’ll join our interactive Facebook group at: https://www.facebook.com/groups/MainePetExpos/. As with all What a Great Event! shows, the Greater Bangor Pet Expo will offer opportunities for non-profit organizations to fund-raise via volunteering and through other means. You can find more info on this page, as well as on pages 13 & 15 of the attached Exhibitors Manual. We’d love to talk to you about your possible role in helping to plan the Expo, sponsor/exhibit/advertise, or even present a workshop or other activity! Linda Snyder, M.S., President, What a Great Event! This entry was posted in Bangor Pet Expo. 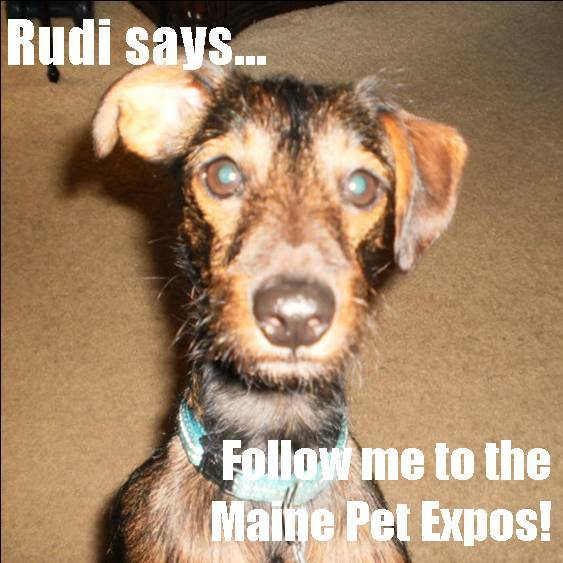 Rudi Says… Follow Me to the Maine Pet Expos! This entry was posted in Androscoggin Pet Expo, Bangor Pet Expo, General. Adopt a Kitty! From the Greater Androscoggin Humane Society. The best way to reach us is by email at LSnyder@regroupbiz.com. Thanks!